- Premium High Quality Materials. Non Slip, will NOT slide across the bar or slip due to sweat or moisture. 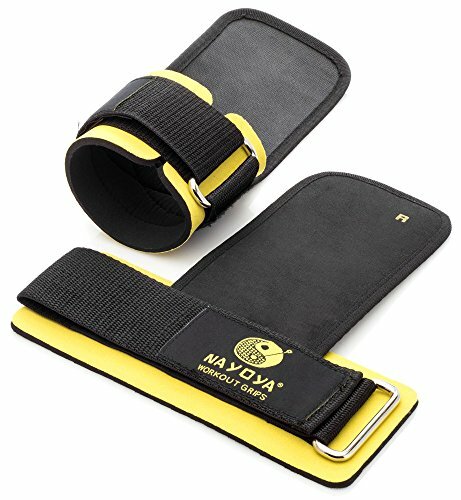 - These non slip grip lifting straps are superior to old school grips that were too stiff to wrap around the bar. These grips are flexible and durable, allowing you to workout without grip fatigue and will not cause blistering calluses. - The comfortable neoprene padded wrist support fully supports and cushions your wrists during intense weight lifting and exercise allowing you to lift heavier weights while feeling one with the bar. Patented and adjustable for any size wrist. Features comfortable neoprene padded wrist support of over 3 inches in length to fully support and cushion your wrists during intense weight lifting and exercise to avoid injury. Non slip grip removes grip fatigue and protects your palms from calluses.